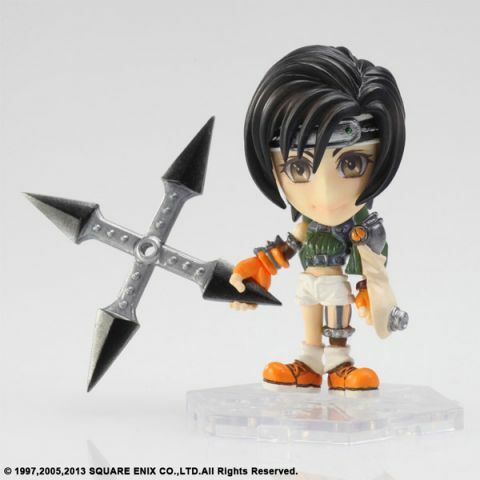 Popular characters Cloud Strife (FINAL FANTASY VII Version), Tifa Lockhart (FINAL FANTASY VII: ADVENT CHILDREN Version) and Yuffie Kisaragi (FINAL FANTASY VII) from the FINAL FANTASY series make their return in super-deformed mini figures! Pose Cloud with his signature weapon, the Buster Sword or riding triumphantly atop his motorcycle Hardy Daytona, Tifa in multiple action poses with exchangeable hair, or Yuffie with her Shuriken in her FINAL FANTASY VII or ADVENT CHILDREN costumes! Even at 3 inches tall, Square Enix Products' signature detail work and craftsmanship are apparent. With the potential to display even in a small space, these are a must-have item for FINAL FANTASY fans! Pick your favorite hero or heroine from your most beloved FINAL FANTASY installment... Or better yet, collect them all!